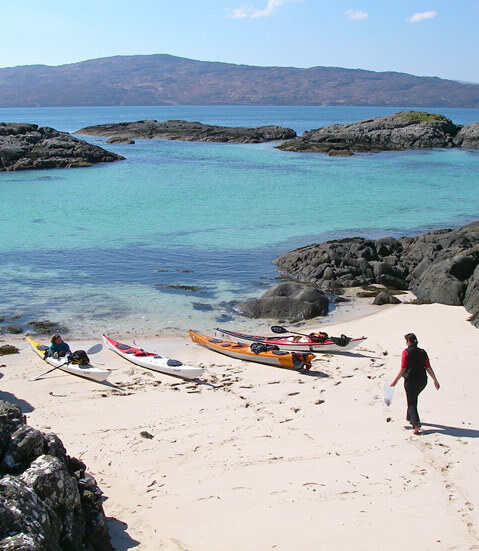 Sea-kayak Guiding & Coaching in one of the most spectacular areas on the West Coast of Scotland! Join us, whether you have experience or not, as we explore the coastline around the Sound of Arisaig, seeking out white sandy beaches, rocky headlands and sheltered lochs, with a backdrop of the Small Isles of Eigg, Rum and Muck. Enjoy wildlife sightings including Sea Eagles, Golden Eagles, Puffins, Gannets, Dolphins, Otters, Basking Sharks, Minke Whale and many more . . .
Introduction, Improver and Advanced Courses . . .